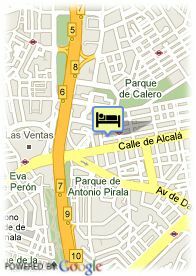 Alcala, 269, 28027 Madrid, Spanje. Located in the busy Alcalá shopping street, Rafael Hoteles Ventas is a welcoming and luminous hotel that aims to serve the tourist area in which it is situated. 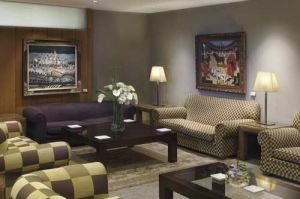 It will surprise guests with its decoration comprising an outstanding collection of art works, together with a typically traditional ambience, fitting of the Las Ventas The 111 rooms of this hotel are designed and equipped with the latest techonologies to satisfy the client in business travel or who come to Madrid in cultural or touristic trips. It is an ideal hotel for the organising your events and professional and personal meetings. It has 1 syndicate room and 5 meeting rooms which are open, soundproofed. They offer all the necessary service to help make your meeting a resounding success. Betalende overdekte parking aan het hotel (16.59 €).